Magnification: 1X Sight Window: 25mm x 16mm;.98" x.62" Elevation Adjustment Range: 3 Degree or 190" at 100 yds (524 cm at 100 m) Windage Adjustment Range: 3 Degree or 190" at 100 yds (524 cm at 100 m) Set Value for One Scale Division: 1 MOA or 1" at 100 yds with 60 scale divisions per turn Sub tension of the Aiming Dot: 4 MOA (10.5 cm at 100 m) Parallax-Free Sighting Distance: approx. 50 yds Recoil Resistance: At least 1000 Gs Operating Temperature Range: -10 DegreeF to +130 DegreeF (-25 DegreeC to +55 DegreeC) Storage Temperature Range: -40 DegreeF to +160 DegreeF (-40 DegreeC to +70 DegreeC) Power Supply: 3V with one CR 2032 Lithium battery Dimensions: L 2.0" x W 1.0" x H 1.1" (52 mm x 26 mm x 28 mm) Weight (in operating condition without mounting materials): 0.9 oz (25 g). Included: Allen wrench to tighten fasteners Screwdriver Adjusting disc Protective cap 3V Lithium battery (CR 2032) Operating instructions Weaver/Picatinny-style mount Extra rubber sealing ring for battery compartment, 3 Year USA warranty. 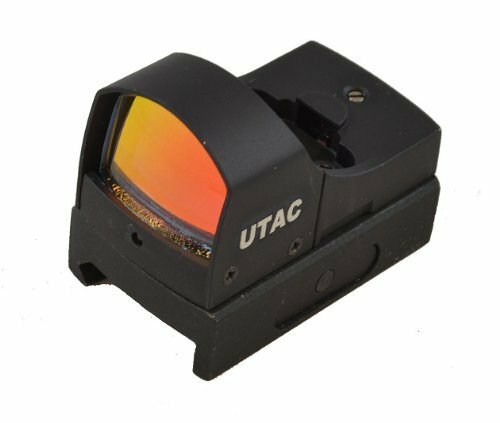 If you have any questions about this product by UTAC, contact us by completing and submitting the form below. If you are looking for a specif part number, please include it with your message.